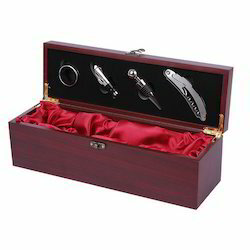 We are one of the most reliable companies in this domain and are into offering Wine Packaging Box. Wooden Elephant Wooden Peacock Wine Box. In order to retain our goodwill in this industry, we are providing a latest array of Painted Elephant Bottle Box. Wooden Hand painted Single Wine Bottle Storage Box is an fabulous home decorative and hand made gift item. 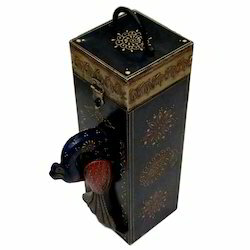 The beautiful wooden wine case has exotic peacock on front panel, and comes with a handle to facilitate easy handling. It can accommodate one wine bottle easily. Sweta Tradings & Manufacturing Co.